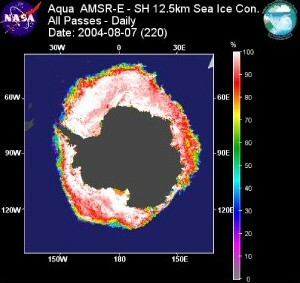 Antarctic sea ice concentration, ranging from 0 percent (purple) to 100 percent (white) on 07 August 2004. Antarctica is shown in grey, and the unfrozen ocean is shown in dark blue. Sea ice concentration was calculated from data measured by the Advanced Microwave Scanning Radiometer-Earth Observing System (AMSR-E) sensor aboard NASA's Aqua satellite. —Image courtesy of Matt Smith, Information Technology & Systems Center, University of Alabama at Huntsville. 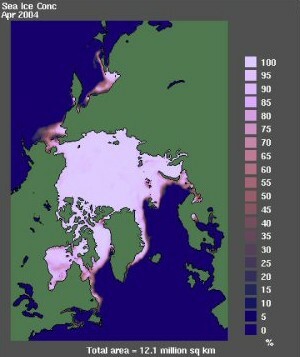 Arctic sea ice concentration in April 2004, calculated from data measured by the Special Sensor Microwave/Imager (SSM/I) on the Defense Meteorological Satellite Program (DMSP) satellite. The image is centered over the North Pole, with continents shown in green. —Image courtesy of Florence Fetterer and Ken Knowles, National Snow and Ice Data Center, University of Colorado, Boulder, CO. Objects at the earth's surface emit not only infrared radiation; they also emit microwaves at relatively low energy levels. When a sensor detects microwave radiation naturally emitted by the earth, that radiation is called passive microwave. Clouds do not emit much microwave radiation, compared to sea ice. Thus, microwaves can penetrate clouds and be used to detect sea ice during the day and night, regardless of cloud cover. Microwave emission is not as strongly tied to the temperature of an object, compared to infrared. Instead, the object's physical properties, such as atomic composition and crystalline structure, determine the amount of microwave radiation it emits. The crystalline structure of ice typically emits more microwave energy than the liquid water in the ocean. Thus, sensors that detect passive microwave radiation can easily distinguish sea ice from ocean. A major drawback to measuring passive microwave radiation is that the energy level is quite low. As a result, the radiation must be collected over a larger region. Details of the sea ice, such as leads, are not easily detected. Because of their ability to detect sea ice through clouds during the day and night, passive microwave sensors provide nearly complete images of all sea ice-covered regions every day. These sensors have provided the most complete, long-term observations of sea ice, allowing scientists to detect notable changes in Arctic sea ice. Sea ice observations from passive microwave sensors began in 1972 with the Electrically Scanning Microwave Radiometer (ESMR) aboard NOAA's Nimbus-5 satellite. In 1978, NASA's Scanning Multichannel Microwave Radiometer (SMMR) provided detailed, reliable information about sea ice. In 1987, a series of DMSP Special Sensor Microwave/Imager (SSM/I) sensors continued the time series, or long-term record, of sea ice data through present. In 2002, NASA launched the Aqua satellite, which carried the Advanced Microwave Scanning Radiometer-Earth Observing System (AMSR-E) sensor. The system's improved technology complemented the time series of sea ice data. ESMR, SMMR, SSM/I, and AMSR-E sea ice data are available from NSIDC.